I am fascinated by bees, they look so furry and cuddley and sweet and you can speak with them and they respond. There is a chapter in the Holy Quran name after the noble sacred bee. Surat An-Naĥl (The Bee) – chapter 16. I was intrigued to see how they fly when thinking about designing sky gardens and placing bee hives on the roofs, from what I found a few tower blocks in Dubai should prove no effort for the mighty bee. “The highest record for a bumblebee is just over 5600 metres and that’s in the Himalayas,” says Dillon. But flying at high altitudes presents bees with a number of challenges. For a start there is reduced air density and this makes it hard to produce lift. Also, there is less oxygen at high altitudes and a flying bumblebee needs 15 to 20 times more oxygen than an elite athlete, says Dillon. Dillon, and colleague Dr Robert Dudley from the Smithsonian Tropical Research Institute in Panama, wanted to find out more about how bees flew at different altitudes. 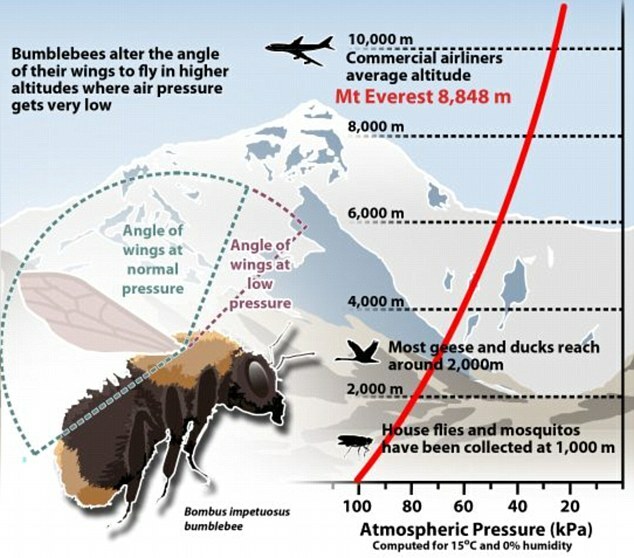 They caught bees flying at 3200 metres and put them in air-tight plexiglass flight chambers, which were able to have their air pressure reduced to simulate different altitudes. “We found that on average all the bees we tested could fly above 8000 metres and we had bees that flew above 9000 metres,” says Dillon. The researchers found that the bees were able to create lift by moving their wings through a bigger angle. But Dillon says he still doesn’t know how the bees are able to fly with so little oxygen at high altitudes. “It’s remarkable that they can do it but we’re not sure how yet,” he says. ” Allah(God) knows best.